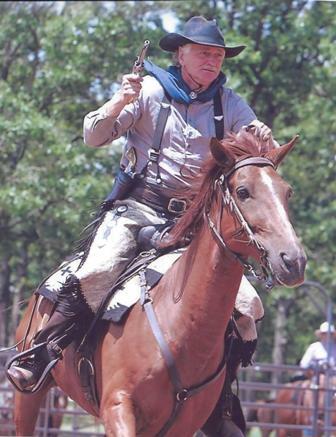 It was a very sad day at the ranch on Sunday, October 21, 2012: our beloved horse Mister Cloud died. Cloud was an extremely friendly horse. He had fabulous and delightful mannerisms and a big heart – he would do whatever we asked of him. Cloud was the leader of our herd (until his medical conditions caused him to yield that role to a younger, bigger horse a few years ago) and it was always a joy watching him take the ‘herd leader’ chores quite seriously as he maneuvered various horses this way and that or broke up overly aggresive horse playing by sending the affected parties to neutral corners of the pasture. Cloud and I learned the sport of Cowboy Mounted Shooting together, and he loved that fast-paced horse-and-man team sport as much as I did. Matter of fact, together we were the CMSA Mens Level 3 National High Points Winners in 2007 (Cloud retired from active riding in 2008 because of his medical problems, which were related to increasing problems with his hips and hind leg joints). A great horse and a great friend, he is buried here on the ranch. If you’d like to see more photos of Cloud, go to our ranch website at www.FlyingB-Ranch.com and browse through the photo gallery. He is the horse on the left of the ranch website’s opening splash page (with the music), and also the horse at the end of that musical sequence. Goodbye Mister Cloud, we loved you. We always will.